Well, it has come down between two colors. I like both of them, and either one will look great in my kitchen. I just have to decide between one or the other. 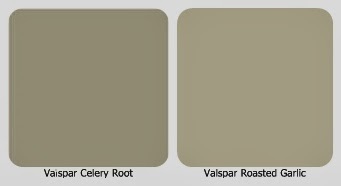 Which would you choose for my kitchen? Now, one thing you CAN ignore is the color of the lower cabinets. They are going to be painted the same color as the upper cabinets, so the color of the oak is not an issue. Neither is the color of the floor, because that will be changed eventually also. One thing you might want to know when making your decision is the kitchen does not get a lot of natural light. Okay… So which would you choose… Valspar Celery Root or Valspar Roasted Garlic. PrevPreviousKitchen Renovation… It’s not done, but it’s looking good!